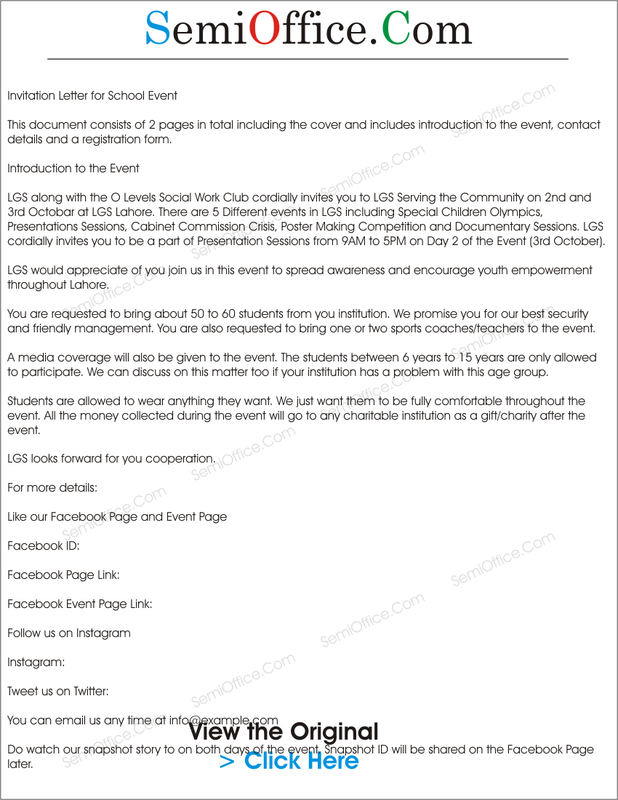 Sample invitation letter to schools for participation in the school event organized by the students and school management. 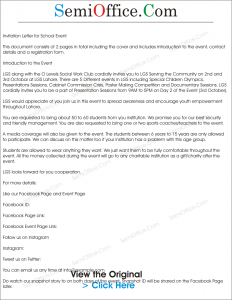 This invitation letter from school to other schools, partner schools, competitive schools for competitions, presentations, games etc. We proudly present our annual play for year 2014 going to held on 2nd march . We humbly welcome you as our guest in this beautiful event. We believe that your presence will encourage our students to work hard. Timings are from 9 am to 3 pm. It is to be held in the premises of the institute. Your presence would be appreciable. ISC Lahore is holding a Pakistani and Turkish Universities Mini Expo on the school premises. We would like to invite you to participate in this event on the afternoon of Thursday, March 15, 2018. To this effect, kindly find attached an invitation which gives details of the mini expo. Our school has arranged a function of annual prize distribution. And we are considering you as a chief guest in our school. We are warmly inviting you as a chief guest of our school’s function of annual prize distribution. Your presence will make us enthusiastic and joyful. Give us the chance to serve you as a chief guest and make us thankful to you for your kind favor. This document consists of 2 pages in total including the cover and includes introduction to the event, contact details and a registration form. LGS along with the O Levels Social Work Club cordially invites you to LGS Serving the Community on 2nd and 3rd Octobar at LGS Lahore. There are 5 Different events in LGS including Special Children Olympics, Presentations Sessions, Cabinet Commission Crisis, Poster Making Competition and Documentary Sessions. LGS cordially invites you to be a part of Presentation Sessions from 9AM to 5PM on Day 2 of the Event (3rd October). LGS would appreciate of you join us in this event to spread awareness and encourage youth empowerment throughout Lahore. You are requested to bring about 50 to 60 students from you institution. We promise you for our best security and friendly management. You are also requested to bring one or two sports coaches/teachers to the event. A media coverage will also be given to the event. The students between 6 years to 15 years are only allowed to participate. We can discuss on this matter too if your institution has a problem with this age group. LGS looks forward for you cooperation. Do watch our snapshot story to on both days of the event. Snapshot ID will be shared on the Facebook Page later. I’m writing this to invite you for a very useful and entertaining program designed to exhibit various cultural activities. This is going to be a full day program where some international guests are also likely to join to witness this fantastic event. The venue is still to be decided by the College management which is likely to be our main branch located near Abu Dhabi Mall. However, I will confirm this in the coming week. The day is going to be Sunday 29th of January. Please do come with your family as this is a wonderful opportunity for us all to enhance our knowledge about our rich culture. We would like to invite you to the Internship Fair at LACS School System, on 13th March, 2018 from 09:15 am to 12:30pm. It would be an opportunity for our students to become familiar with your NGO/Organization and its mission. We at LACS School System lay great stress upon the involvement of our students in internship during summer break in the areas where they realize their social responsibility. We would really appreciate if your presence at the Fair.